EUGENE, Oregon — "Hayward Magic" is alive and well. The record crowd of 12,244 on Friday night at Hayward Field bore witness. Between LSU opening Day 3 of the 2016 NCAA Division I Outdoor Track & Field Championships with a thrilling win in the 4×100 relay and Florida capping a championship season with a 4×400 title of its own, individual performances electrified the cool June air. Let’s look back at what turned out to be a memorable Friday in Eugene. Before Friday, only one man completed the 100, 200 and long jump triple in NCAA history. You might have heard of him: Jesse Owens. And that happened in 1936. Well, Owens has company in the form of Arkansas senior Jarrion Lawson. After opening the meet running second on the third-place 4×100 team, Lawson turned his attention to the open 100 and 200, where he was seeded sixth and second, respectively. This was all after Lawson won the long jump by nearly nine inches two days earlier. In the 100, Lawson overcame a slow start to beat Tennessee’s Christian Coleman to the line. Lawson clocked a time of 10.22 against a 2.3 meters-per-second headwind. Less than an hour later, Lawson surged ahead of Coleman once again — this time in the 200. Lawson ran 20.19, while Coleman — the indoor champ at the distance — split 20.26. All told, Lawson scored 31.5 points for the Razorbacks and set a modern-era meet scoring record. If you took Lawson’s points away from Arkansas and recalibrated the team scores, here’s how they would look: 1. Florida – 56, 2. Texas A&M – 50, 3. Oregon – 48, 4. LSU – 41, 5. Jarrion Lawson – 31.5, 6. Tennessee – 30, 7. Arkansas – 24.5. There isn’t an adjective that correctly describes the meet Lawson had. Friday marked the 50th anniversary of Jim Ryun’s 800-meter collegiate record of 1:44.3. Texas A&M super freshman Donavan Brazier made sure Ryun’s mark wouldn’t see past its golden jubilee. Two days after running the second fastest time ever by an American junior, Brazier demolished Ryun’s record by nearly one second. Brazier kicked past Mississippi State’s Brandon McBride as the Hayward faithful roared and crossed the finish line in 1:43.55. "I was just focused on winning," Brazier said. "I wanted to get 10 points for my team. "I didn’t even know about the record until the prelims when I ran the 1:45. It means a lot because it was a 50-year-old record." Brazier knew the race would be quick once he looked at who made it through prelims. "I had been mentally preparing the past few weeks knowing it would be possibly the fastest 800-meter field there is," Brazier said. "Sometimes going 50 (on the first lap) felt pretty comfortable and the last 200 I felt strong. I felt good." Brazier and McBride both went under the meet record set by Mark Everett in 1990. McBride finished in 1:44.50, the fastest time ever run by a runner-up at NCAAs. No one knew it at the time, but the triple jump had major implications on whether or not Arkansas or eventual champion Florida would win the team title. Both teams had one entrant in the event — KeAndre Bates for the Gators and Clive Pullen, the indoor champ, for the Razorbacks. Based off pre-meet projections, Pullen was tabbed for another podium spot while Bates wasn’t expected to be a factor. That all changed when Bates punched his ticket to the championship round and Pullen sandwiched a leap of 15.01 meters (49-3) between two fouls on his way to a 23rd-place finish. When the dust settled, Bates soared 16.73m (54-10¾) with a stiff tailwind at his back and finished second. Just like that, eight bonus points fell into Florida’s lap. Let’s say the projections were right and Bates and Pullen switched spots. That would have left Arkansas with 64 points and the Gators with 54 entering the 4×400. Then the only way Florida would have been able to tie for a national title would have been to win the final relay. Instead, the Razorbacks led Florida by two points going into the 4×400, an event in which Arkansas didn’t have an entry. That meant if the Gators finished better than sixth, they’d win their third national title in the past five years. Florida took second behind LSU and the rest, as they say, is history. 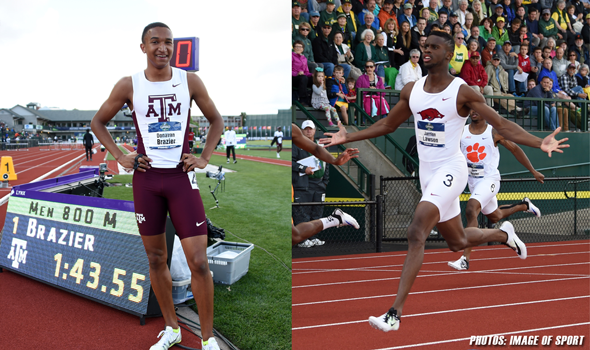 Here are how the 10 men on The Bowerman Watch List fared on the final day of NCAAs. Oregon’s Devon Allen — Won NCAA 110-hurdle title in 13.50. TCU’s Ronnie Baker — Anchored 4×100 team to sixth-place finish in 38.72. Oregon’s Edward Cheserek — Completed the distance double (5000-10000) for the second year in a row. Won the 5000 with a time of 13:25.59. Pennsylvania’s Sam Mattis — Finished second in the discus throw. Oklahoma State’s Nick Miller — Did not compete (hammer throw champ). LSU’s Nethaneel Mitchell-Blake — Anchored 4×100 team to a Hayward Field record time of 38.42 and an NCAA title. Finished eighth in the 100 and did not start the 200. Texas A&M’s Lindon Victor — Did not compete (decathlon champ). Washington’s Izaic Yorks — Finished second at 1500 meters.